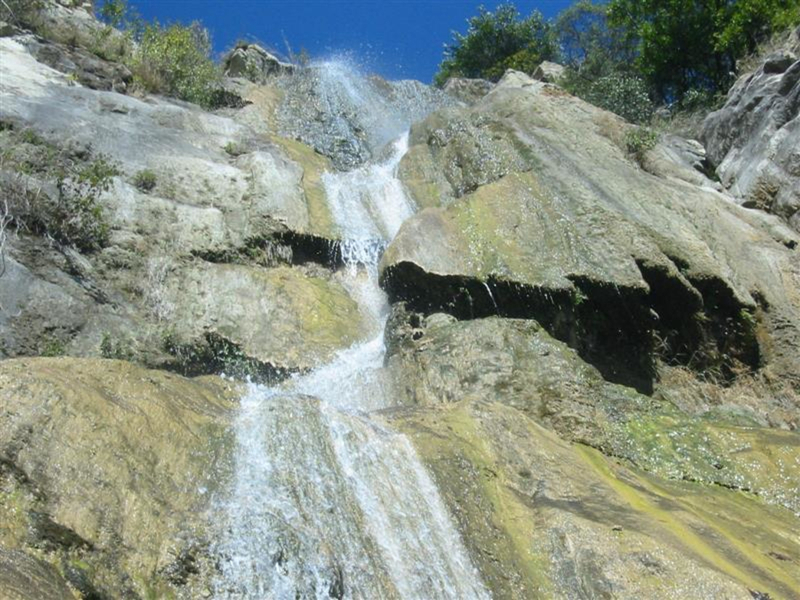 This difficult, rocky hike gives those who conquer it a nice waterfall reward. Yes- but it may be difficult for them in some places. One of the more difficult hikes in the Santa Barbara front range is the route to Tangerine Falls. As long as the falls are flowing though, this hike is definitely well worth the effort. Even though the Tangerine Falls hike is only about 3-miles roundtrip, it's the constant rock hopping and creek crossing that makes it such a good workout. The boulder-hopping, scrambling, and light climbing make this an all-body workout. It's 1.5 miles to Tangerine Falls. The rugged path up is equally as interesting on the way down, so don't let up your vigilance on the descent. The waterfall itself is quite photogenic, though it can run low in the late summer months. If you like your hiking with a rugged twist, this is your trail. The waterfall at the top is a fitting reward. If you're less sure-footed or reluctant to leap across small gaps and creeks, you may not have a whole lot of fun! The trailhead begins on East Mountain Drive about 1.5 miles west of Hot Springs Road, just before the creek crosses the road. This trailhead is also the trailhead for a few other hikes, so the beginning section can be a bit confusing. About a quarter mile in you’ll come across a bench and a creek crossing sign for the West Fork. Follow this trail until you come to an unmarked intersection by a couple of large boulders. Take a right down towards the creek and follow the “trail” (more like boulder field) to Tangerine Falls.